Ted McKenna est né le 10 Mars 1950 à Glasgow, en Ecosse. Tout jeune, Ted forme avec son père Hugh, le groupe "Vibration" avant d'intégrer "Rare Breed" (futur "Bubbles"). En 1970, il rentre dans le groupe "Dream Police". Ensuite, Ted McKenna joint le groupe "Tear Gas" avec qui il enregistre en 1971 leur 2ème album (Tear Gas Regal Zonophone SLRZ 1021). C'est à ce moment qu'un certain Alex Harvey de Glasgow, les découvre et décide de former le "Sensational Alex Harvey Band" en Août 1972, groupe qui durera jusqu'en 1977. En 1978, Rory Gallagher se sépare du pianiste Lou Martin et du batteur Rod De'Ath. Ted McKenna rejoint alors le Rory Gallagher Band avec lequel il enregistrera 3 albums (Photo Finish en 78, Top Priority en 79 et le live Stage Truck en 1980). Ted apporte une puissance supplémentaire qui va orienter la musique de Rory vers une sonorité plus hard. Ensuite, Ted McKenna rejoindra le Greg Lake Band puis le MSG et Ian Gillan. Ted McKenna played with Rory on three albums: Photo-Finish, Top Priority and Stagestruck. In this exclusive interview he talks about his fond memories of his time spent with Rory. Dino McGartland: What were you doing just prior to joining the Rory Gallagher Band? 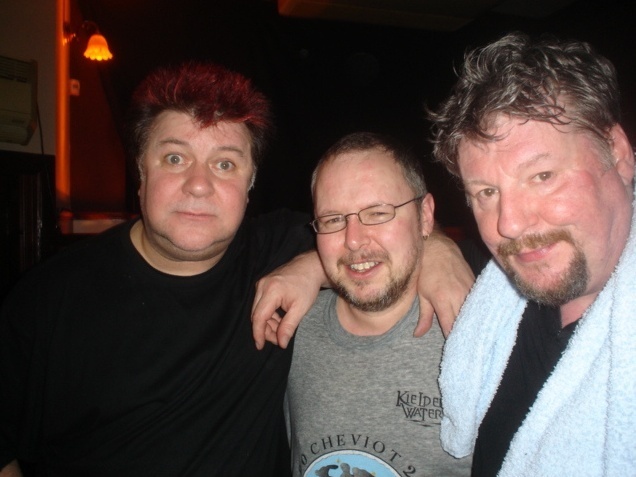 Ted McKenna: Well after the Sensational Alex Harvey Band split up in 1978 I did a tour with Zal Cleminson and Chris Glenn (SAHB) Billy Rankin (who later joined Nazareth) and a guy called Leroy Jones who had worked with the American band The Tubes. We did a British and Scandinavian tour but then decided to pack it in because in my opinion, Chris, Zal and I had been together for quite a long time and we needed a break from each other. Shortly after the SAHB split, Alex and I went to a club somewhere in North London for a drink, and to see an old pal of his play who he knew from the Hamburg days. While we were at the gig I bumped into an engineer I knew from Air Studios. He told me that another old friend of mine, Colin Fairley, a Scottish ex drummer was working as an engineer with Rory Gallagher, and apparently Rory was struggling to find a drummer, he’d gone through quite a number. Of course I was interested and the next day I received a ‘phone call from Colin who said why don’t I come down for a play with Rory, and that’s just what I did. I had a bit of a blow with Gerry and Rory down at Air Studios and then went up to Scotland, where I got the call from Don Gallagher. He asked me if I’d like to come down to London that week to rehearse for the Macroom Festival in Ireland, so in Typical Rory fashion I went tearing down there and ended up playing in Ireland the same week! D.McG:Were you familiar with Rory’s music at that point? T.McK: When I was about seventeen I used to be in a band in Scotland that supported Taste. It was the first tour they did with Eric Kitteringham and Norman Damery, and I’ve still got a photograph of the band that Rory signed for me!! We played a gig called “The Place” in Edinburgh, He was doing blues but he was also doing things like Summertime and a kind of jazz thing. One of the memories I have of that gig was that The Place didn’t have a dressing room so Rory was in the car park with us. Our vans were parked up together and he was putting on his brown suede boots, his plaid tartan shirt and his jeans right there in the car park with us! At that time he struck me as being a nice guy, he was really nice to us. After that I heard about him playing the Isle of Wight festival and eventually when I was doing quite a lot of touring in Germany with the Sensational Alex Harvey Band, I would see Rory Gallagher posters up all over the place! D.McG: What are you’re memories of that first gig with Rory? T.McK: Well, I’ve actually got a tape of the first rehearsal. It was quite high-energy stuff compared to what I’d been used to, it was really taking the paint off the walls when we were going at it!! I was still learning the material and had a big pile of tunes to learn and only one week to rehearse with them. I was actually learning the stuff on the plane on the way over! Even after all the rehearsals I hadn’t prepared myself for what the live gig would be like. The energy levels went up another six gears and it just took my head off!! Rory hadn’t played for a while and I don’t think had gigged for a while either so when we up there it was really a very high-powered feeling, the adrenalin was really pumping! We went down in Donal’s Jensen, which I thought was real rock’n’roll. We got up on the stage and by the end of the gig I had blisters on my hands, it was great - quite uphill. D.McG: Did it come to you as a surprise to see Rory’s double life on and off the stage? Here was this quiet soft- spoken person and yet when he went onstage he was completely different. T.McK: It struck me that the amount of personality and drive he had when he performed was quite different from the mild and gentle person off-stage, when he was a real gentleman. Everyone that knew him would say the same I’m sure, but when he put on the guitar and went in front of an audience there was a complete turn-a-round in the way he drove. He went from being quite laid back to being very forward, very aggressive, which is what rock’n’roll is all about. D.McG: I get the impression that there was no time to ‘take it easy’ in the sense that all eyes where on him and you were constantly looking out for a hand signal to tell you when to stop and start. Did you have to concentrate the whole time while on stage? T.McK: Yeah, yeah. You tend to do that .I mean I wasn’t used to doing that with the SAHB for instance, because we had a set stage performance and I drove the band along. The difference with Rory was that I had to watch out for the intros. The thing about Rory was he used to wear the audience out!!! That was his thing, he would turn around to me and say “lets take the tempo up a bit” because he just felt that the audience were a bit complacent and he would do anything he could to try and get them wound up and get them going, and that would mean sometimes playing songs slightly faster than they were recorded. So I was always prepared for the changes. D.McG: Would you say he was a perfectionist when he was recording? T.McK: Well he was looking for a particular thing. To say ‘perfectionist’ is maybe a way to describe it, but it was more like he was looking for a particular ingredient in the way he wanted the track to sound. Sometimes, when he’d had a chance to listen to them all, he’d end up going with a take that he’d done earlier, one that he felt was right for him. He took it very seriously, especially if he was going to overdub guitars. He obviously wanted to have one that had the right feel to it. One of my favourite tracks on Photo Finish is ‘Last of the Independents’, because to me that always summed up Rory. I always felt that song was about him because of how he wouldn’t bend to the will of record companies or he wouldn’t bend to people’s views of what they thought he should do. He always stood for what he believed in, what he believed about the blues and rock’n’roll. He would always be true to that. Every time I hear that song I always think of Rory. D.McG: He always had the tag of ‘Hard working Rory’; it must have been tough having to be on the road a lot. What was it like on the road with Rory? T.McK: For me it was a very happy band. At the time I was with Rory there was Gerry, Phil McDonnell (who is still a great friend of mine) doing the sound, Pete Collins was the Tour Manager, and with Tom O’Driscoll as the Road Crew, and sometimes Donal being there, it felt like we were a close family. We always had great nights between gigs. On our nights off we’d all get together in a room with a carry out and a few bottles of beer, and we’d just sit, play cards and have a great time. It was good company; there was a good sense of humour and good craic!! D.McG: What were the audiences like in America, and had you a favourite country that you like to visit? T.McK: When I think back, there are so many gigs in the States that I enjoyed; we used to play some great clubs like Mississippi Nights, or The Mocambo in Toronto, or some great gigs in New Orleans; I used to love those club gigs. When it came to Rory, and the hard rocking blues we were performing, the American audience used to really whoop it up; it’s what it’s all about - beer drinkin’ and hell raisin’!! D.McG: So why did you decide to leave the band? D.McG: Did you still keep in touch over the years? T.McK: Oh Yeah. I went down to see him play at the Town & Country club and I came back stage and was talking to Rory and Donal about how good it was seeing the band again and that they were really cooking, but I got the impression from the conversation that Gerry and Brendan were thinking of leaving and that Rory might like to play with me again. Sometime later Donal called and asked me down for a play. It was 1991 and it was great just to be around the guys again, just like the old days! Donal gave me copies of Fresh Evidence and the other later albums which I’ve still got, but it never really happened; just not meant to be I guess. D.McG: Were you aware that Rory had been ill at this stage? T.McK: Well at the time I went down there Rory was still fine as far as I could make out, but sometime before that I went to see him play in Glasgow. It was at the time when he asked Gerry and Brendan to play some gigs with him even though they had officially left the band. I was chatting to Gerry, Brendan, and Tom O’Driscoll in the dressing room before the gig when in came Rory and said “Edward” (laughs) it was the only time he’d called me that. The thing was, I was amazed at how he looked, and when they went onstage I stood at the front and couldn’t believe how he performed; he didn’t do anything! He just sang the tunes and when it came to the solos he’d just nod to the keyboard player; he never took it by the scruff of the neck like he usually did and that’s when I sensed there was something wrong. I saw Donal at the bar later but I didn’t know what to say, I felt really bad, it was like “What’s wrong with him? “ What the hell’s the matter”? D.McG: It must have come as a terrible shock to you when you heard of his death? T.McK: I had heard that he wasn’t well, I saw that photograph of him in Q magazine and I thought that he looked really ill; in fact it really shook me when I saw it because he looked twice his age! I couldn’t believe it. When I heard of his death I was very very sad. A few weeks before he died someone had given me some video footage of gigs that I had played with Rory that I had never, ever seen. I was absolutely knocked out and really chuffed to see some of these gigs; it brought back all the memories. Within a month I heard that he had died and it was such a blow to me after watching those tapes! I am always thinking back to the times we had. I proudly carry one of the tour brochures from our travel agent, it says ‘Rory Gallagher Band’ on it, and it has my name in gold. It’s leather bound and contains a gig list. I occasionally show it to some of my students and say now that’s a tour! (laughs). It takes in New Orleans, Austin Texas, Houston, St. Louis, Memphis, Nashville, Atlanta, New York, Boston, Albany and Toronto. That whole time we worked our arses off; we were on the road all the time. We’d finish an American tour and then go straight to Germany, Australia, New Zealand, and then do a British tour then back to America, It was pretty much on going all the time and I loved it, I was really happy. D.McG: Did you ever think that Rory missed out? Here was one of the all time greats but at the same time he never truly got the recognition he deserved. T.McK: When I joined and found out the story about the album that he did that was scrapped. I can’t remember who told me the story but apparently after he’d ordered the record company to scrap the album he was getting out of a taxi at the Sunset Hotel in Los Angeles (My favourite hotel) when he trapped his thumb in the door, it happened on the same night. My interpretation of the incident was that he didn’t want somebody else interpreting what his music should sound like. To a record company, when you had a guy that looked and sounded like Rory you had a million dollar gold bar in your hand! Trouble is the record companies would then have wanted to smooth off his rough edges and make him more marketable to the general public, and Rory would have objected to changing his identity for any reason. So if you ask “Did he miss out?” I’d say no because he wouldn’t have wanted to play the game thing because the record company would end up telling you who to have in your band, and you should have a couple of girl singers and you should have this and you should have that and before you know it everything’s changed, like it happened to Joe Cocker. With Rory’s looks, which are very important to a record company, and his guitar playing he could have been absolutely huge but that’s not what his music was about, that’s not what Rory was about. It always struck me that the cover of the Photo Finish album was a very glamorous one, which was symptomatic of the record company’s drive to commercialise Rory. He wouldn’t have any of it though. I often wonder what happened to that album; I can’t imagine what it sounded like! D.McG: What are you doing now? Are you still involved in the music business? T.McK: Yes, I work at North Glasgow College as a lecturer. The main thing I teach is music promoting and managing. Which is basically trying to help young guys to know what the music business is all about. I have to teach them from painful experience all the aspects of the music business and all the practical things. I’m almost full time but I’m also putting a band together. I’m trying to do in Scotland what used to be going on when I was growing up. Back then there were venues that had live music. As you know that’s one of the things that has died out to a great extent because of discotheques and all that; it’s totally undermined the work for live musicians. I hope it’s going to develop into something worthwhile; the guys I’m working with are local guys, and all top pros. At this point the interview finished but Ted left me with this final story, which summed up Rory. Back to that first audition at Air Studios after we’d finished playing, Rory, Gerry, and Donal carried my drums down the stairs for me!! I said “You guys don’t have to do that” and they said, “Get out of it, we’re real people, we don’t piss about” It was so unusual and unlike what the rock and roll scene was like. I knew then that Rory was still the same guy who was pulling his boots on in the car park all those years before. Thanks to Ted McKenna for being so open and helpful with this interview. "Legendary drummer Ted McKenna returns to his roots"
Un article du Airdrie & Coatbridge Advertiser qui revient rapidement sur la carrière de Ted McKenna. C'est clair... Il me semble qu'il a été longtemps alcoolique, physiquement il a le syndrome mick Taylor! Début 1981, Ted McKenna quitte le RGB, et rejoint le Greg Lake Band jusqu'en 1982, groupe avec lequel il enregistrera 2 albums ("Greg Lake" et "Manoeuvres"). Un live enregistré à cette période est sorti en 1995 ("Greg Lake In Concert"). Troisième salve dans l’offensive Greg Lake lancée par Esoteric Recordings pour raviver l’œuvre du chanteur et bassiste des légendaires King Crimson et Emerson, Lake & Palmer. 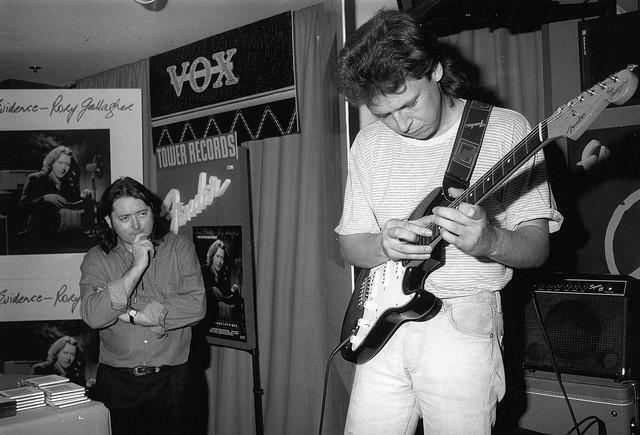 Cette fois-ci, c’est d’un live enregistré par Greg Lake dans le cadre d’une tournée relative à sa carrière solo dont il s’agit. Capté lors du célèbre broadcast King Biscuit Flower King diffusé le samedi soir sur les ondes américaines, entre 1973 et 2007. Cet album live de Lake fut enregistré lors d’un concert le 5 novembre 1981 au célèbre Hammersmith Odeon de Londres. Soutenu par un groupe de rêve, avec Gary Moore à la guitare, Ted McKenna (Sensational Alex Harvey band, Rory Gallagher, Michael Schenker Group, etc. ), Tommy Eyre (Joe Cocker - l’intro aux claviers de sa reprise de « With a little help from my friends », c’est lui, Michael Schenker Group, B.B. King, Gary Moore, Sensational Alex Harvey Band, etc.) et Tristian Margetts (Spontaneous Combustion), Greg Lake y va d’une set list variée comprenant 5 titres issus de ses albums solos, encadrés par 5 reprises significatives puisque 2 viennent du répertoire d’ELP, 2 de celui de King Crimson et une de celui de Gary Moore. Comme quoi je cite mes sources! Précisons que ted McKenna est à gauche sur la photo! Merci en tout cas Nico. Ted McKenna a joué non seulement sur l'album Bassics de Gerry McAvoy, mais il est aussi présent sur l'enregistrement d'un concert du Gerry McAvoy Jam enregistré le 9 février 1979, ainsi que sur l'enregistrement d'un concert du guitariste Dave Edwards. Ces concerts ont été enregistrés au Bridge House et sont parus récemment en CD sur le label Bridge House Records. Plus d'infos sur ces 2 CDs >ICI<. Et Ted McKenna sera sur les dates d'avril Marcel? D'apres http://www.rorysfriends.de/konzerte.php seulement le 29 et 30 janvier (voir au milieu de la page) .........et pour Francfort ????????? Tout le monde s'en fout mais je suis devenu ami sur facebook avec Ted Mckenna !